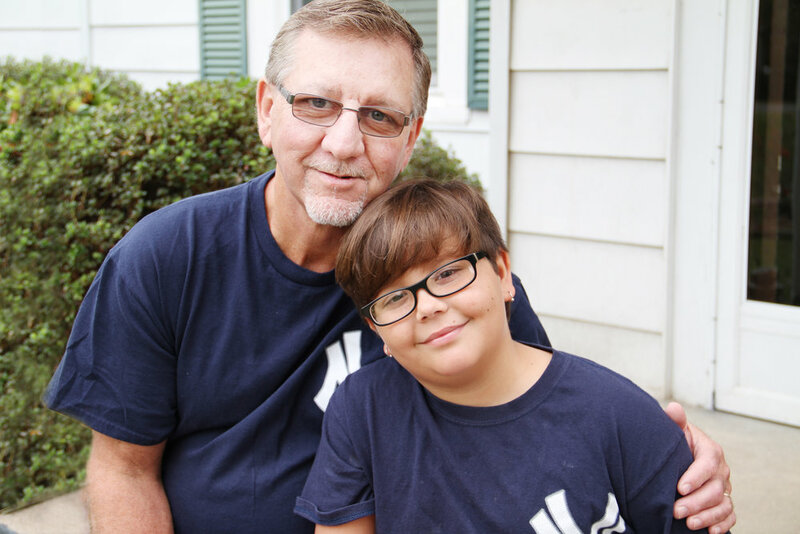 Aiden and his dad Keith were sitting in the Yankees’ dugout when the boy met his baseball hero. A rain shower brought the game’s warm-up session to an abrupt close, giving Aiden and Judge an unplanned period of time to become acquainted. 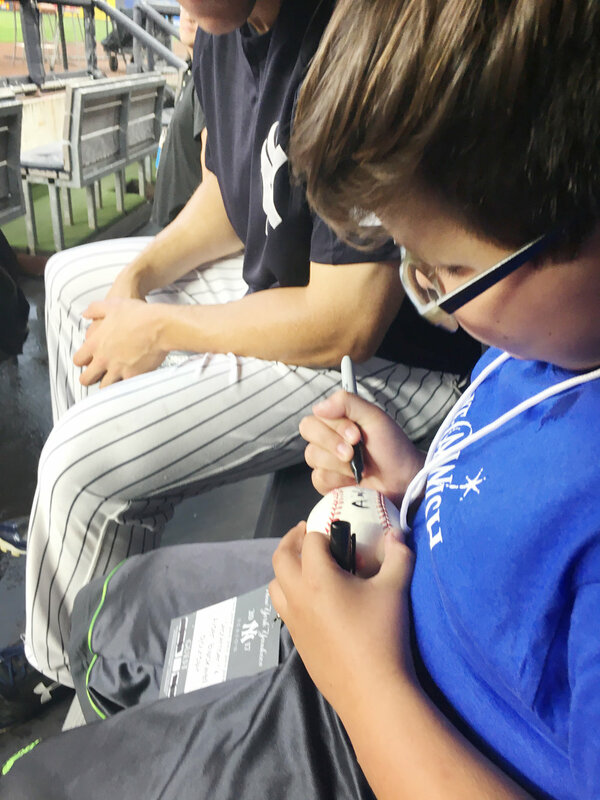 Yankee right-fielder, Aaron Judge asks Aiden to autographs a baseball for him. Aiden was first diagnosed with juvenile rheumatoid/idiopathic arthritis when he was two and a half years old. This disease causes chronic inflammation of the joints. He lives with persistent pain and has excruciating flair ups that have damaged his eyes and have necessitated a number of surgeries. To bring Aiden relief, his doctors keep him on a constant regimen of medications that are changed often as his body adapts to the meds and renders them ineffective. His immune system has taken a big hit also, leaving him vulnerable to everyday maladies. Even a simple cold can be devastating. Aiden is continually attending doctor appointments. Aiden is a huge baseball fan. He plays baseball, too. This past season, he completed his first year of “kid pitch." His parents and grandfather, Allen Forrest, work hard to support Aiden so he can enjoy baseball like other children his age. He has played since tee-ball, and each year Aiden has made the all-star team. “Aiden is a natural at the plate,” Forrest says of the power slugger. “When he was small, I’d take him in the backyard and he would practice. One of the first balls he hit struck me in the head and knocked me out.” His pride in his grandson's talent is evident to all who speak with him. The two share a love of the sport. Forrest said he has always been an Atlanta Braves baseball fan, until this year. The way he sees it, the Yankee organization went above and beyond in providing his daughter’s family and Aiden an experience of a lifetime. He says his favorite baseball player, other than Aiden, is now Aaron Judge. While Aiden visited with Judge, he asked the ball player to autograph a baseball he had brought. He told Judge that he was his hero. Judge signed the ball. Then he told Aiden that he was his hero and asked Aiden to autograph a baseball for him. If possible, Judge went even higher in this fan's estimation. Judge is said to be a person who does “the right thing.” Words such as “humble”, “unselfish” and “kind” are often used to describe him. He is a self-professed Christian. The first words read on his Twitter feed is “Christian. Faith, Family and then Baseball.” He is a person of character that Aiden and other young fans can look up to. Day to day, Aiden tries to live as normal a life as possible. He takes his pills daily, travels with his mom weekly to doctor visits, and is never sure when the next “flare up” will occur. Aiden pictured with his grandfather, Allen Forrest. Photo by Jim Edminson. Aiden and his mom, dad and little sister spent four days and three nights hosted by the Yankees in New York City. “The trip to see the Yankees play and spend a few days as tourists in New York City were beyond what we could have ever imagined,” Clara says. “For Aiden, it was a time to be normal. There were no doctor appointments. He could forget, if only for a few days, that he is sick." Aiden is looking forward to next season. He is disappointed that Judge and the Yankees didn’t make it to the World Series, but he says he is confident that Judge will be in front, leading the team, next year in another bid for the championship.